Just a point, it's Thorney Abbey Rd Blidworth, not Thorne Abbey as on your database for Blidworth deaths. 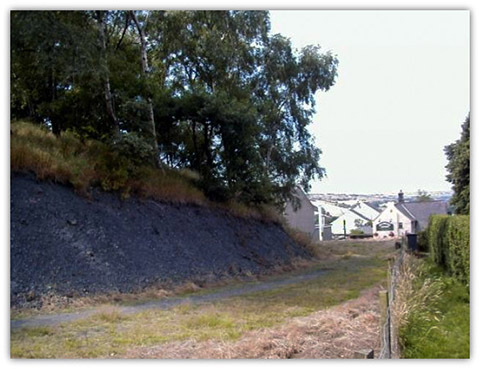 I have looked at your interesting Colliery site for Nottinghamshire and have noticed a small error I think! Levi Cale is given as having died age 23 in a pit a accident (the site records from a fall of (roof) coal) on 05.05.1875 with the resultant inquest held at the Green Dragon, Hucknall 6 day later on 11.5.1875. My partner, Lynn Harrison, a Hucknall girl, is researching her family history and has established from Levi’s death certificate he died on 05.05.1874 and not 1875. He was born in 1851 so the age 23 is right. I only point this out for interest and hope you do not mind. My name is Christopher Jepson and Frederick was a brother to my Great Grandfather Charles Lakin Jepson. Both originated and were Coal Miners in North Staffordshire. Frederick moved to Durham and was the oldest miner to die in the Easington Mining Disaster in 1951. Hi there and greetings from New Zealand! My name is Belinda Tate and I am trying to track down the circumstances around Hunstall Colliery, (Unstone) where according to records a forebear of mine died. Unsure of the details and interested to learn more about the working conditions etc. of the mine. Miners name: EDWARD MARSHALL / DATE OF DEATH 4 JAN 1876 (AT HUNSTALL COLLIERY)/ DOB:30 JUL 1806. Any local historian/ mining historians that might be able to help would be fantastic. It seems like it was a substantial mine for its time. I can only imagine the conditions of mines in northern England during this time of industrial boom were very poor. For me the thought of my ancestor having to manage physically demanding work at age 70 is hard to imagine but I imagine it was common. Hundall is a small village in the parish of Unstone, just north of Chesterfield, in Derbyshire. In many lists it doesn't even exist, but is regarded as part of either Unstone or Apperknowle. The 1881 census returns, Chesterfield, give the name as 'Hundow' but it is known by many variations of this name. Info from Ian Winstanley, unfortunately his site no longer exists but apparently Edward was a Screenman, his job would have been to removed stones, slates, brasses, etc. and take small coal from beneath an iron screen over which the coals, as they came from the hewers, were poured into the waggons or carts. It was while doing this job Edward was killed, he was on the surface, on the tramway when a full tub running down an incline hit him. So far as I can see, from Ancestry, his wife was Sarah Wilkinson but she died June 1851 age 43. She came from Grantham, Lincolnshire. They married 13 Mar 1833 at Sempringham, Lincolnshire, England and had 8 children. I have been trying to locate any information regarding my father who was accidentally killed at New Stubbin Colliery, near Rotherham, South Yorkshire. Cause of death was a roof fall. Hi, it was great glancing through your website - I recently chased an Uncle's death at my local colliery in 1943, Arnold Hodgkiss aged 19. It gives a true matter of fact dialogue, of the self-risk, men took, to work down the pit, I can send a reading, if you're interested. 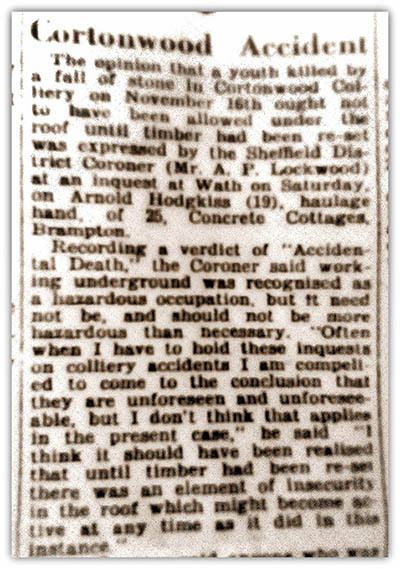 The opinion that a youth killed by a fall of stone in Cortonwood Colliery on November 16th ought not to have been allowed under the roof until timber had been re-set was expressed by the Sheffield District Coroner (Mr A. P. Lockwood) at an inquest at Wath on Saturday, on Arnold Hodgkiss (19) , haulage hand, of 25, Concrete Cottages, Brampton. Recording a verdict of “Accidental Death” the Coroner said working underground was recognised as a hazardous occupation, but it need not be, and should not be more hazardous than is necessary. 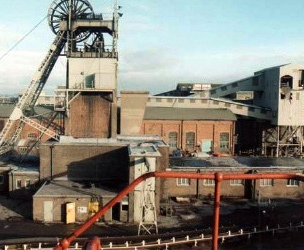 “Often when I have to hold these inquiries on colliery accidents I am compelled to come to the conclusion that they are unforeseen and unforeseeable, but I don’t think that applies in the present case”, he said “I think it should have been realised that until timber had been re-set there was an element of insecurity in the roof which might become active at any time as it did in this case”. 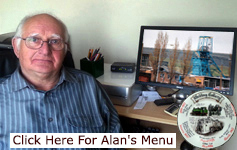 Hi good morning my father worked at Gedling I can just about remember bits of the village. All I want to know is if I remember the houses were built on the estate where u had to climb steps then walk along paths to get to ur door plus there use to be a pond and a bungalow down a path that was a shop tuck shop my father's name was Joe Carr please all I want to know is if poss some photos of how the village was and wot it looks like now please if u could help me thank u sorry if u can't. Dear sir I have been looking through your list of fatalities looking for a Mr Albert Fletcher who got killed at Kiveton Park in a haulage accident date ? Could you enlightened me if I have missed him in your records thank you. There was an Albert Fletcher, aged 24 who died 21 Jul 1910. He was a Filler at the Rotherham Main Colliery, right area, but if the date is way out it is obviously not him. There were three men were working in a long-wall face. Joseph Evans was setting a prop when a large stone fell from a cavity in the goaf, knocked out a prop and smashed a safety lamp. The fall brought down firedamp from the cavity and a sharp explosion resulted. All the men were so severely burnt that they subsequently died. 3 killed.